It absolutely pains me to write this post. Not so much for me, but for my friend. Still my friend. Just not perhaps my mechanic. I was torn last fall whether to send my bike to my Harley dealer 100 miles from home, or keep it in town at a friend’s custom shop. After a bit of delay in bringing the bike in last spring and my traveling out of town far less than I once did, I decided to keep it in town. I also knew that I needed to replace my handlebars, as my experiences had me believing the stock ones were becoming a safety issue. I had dropped the bike off last fall with instructions to do the 10,000 mile service and install some mini-ape handlebars. It was probably February before I got a call asking if I wanted natural or synthetic oil for the service. That’s cool. They were working on it at least. I can’t remember when I started talking to them about the handlebars. It may have been January. 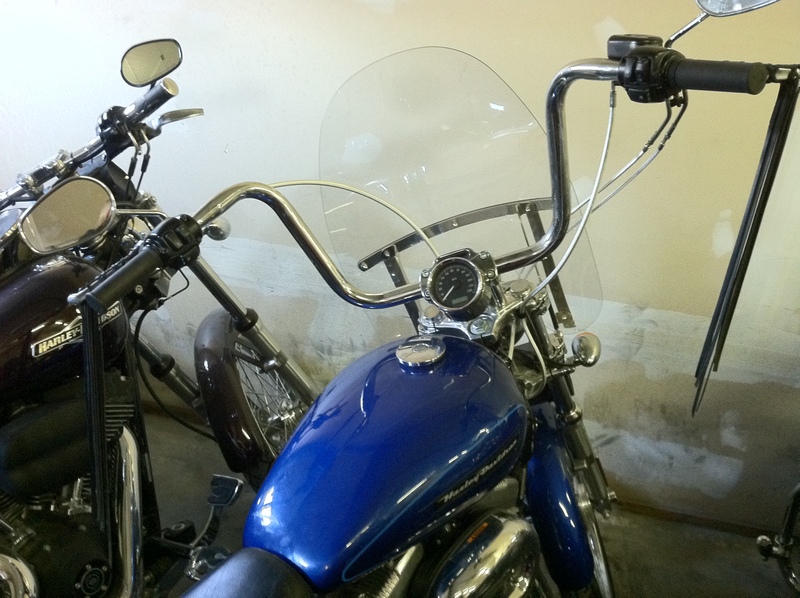 What I had in mind was the mini-apes from a Heritage Softail. They seemed to fit me well. I had stopped by the shop to make a payment and I was informed that I might be able to swap bars with someone. I was shown this pic and agreed to the swap. They appeared to be just what I had in mind. 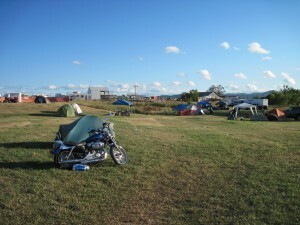 As it turned out, the other party decided to sell their bike, not fix it up, so the swap was off. But I thought it was pretty clear what I was looking for. It wasn’t until mid-March that I stopped by the shop again to make a payment. I asked what the balance was and it was just over what I had planned to make as a payment, so I decided to pay it off. The bike show was in a week or two, so I thought I’d check and see how it was coming along. Had a minor shock because the bike was stripped down and there were these HUGE apes, not mini-apes, on it. OK, the seat and tank were off, so I was sure it wasn’t as bad as it looked, but it took a bit for the heart to return to normal. I spent a fair amount of time at the bike show studying handlebars. Still a little nervous about these huge bars, I went in on April 9 to go pick it up. Called ahead to let them know I was coming. Got there, and even though they had called me to see if I was still coming in, the bike wasn’t quite ready to go. Bars needed to be fit to me, of course, but they also wanted to run it for a bit to get the fluids moving. Fine. So as I was sitting around waiting for them to do this, I was informed that I had a balance on my account. Having less than $5 to my name, that was a deal breaker. Picking it up was going to have to wait until payday – a payday that hadn’t planned on including a bike payment. To be honest, I wasn’t surprised. I was more surprised the previous time when the balance was lower. I had expected more. Realize that my bike is my freedom. I really have no other form of transportation. The car I *own* is really my youngest son’s. I have it until he turns 18. And this year I was too broke to get tires for it until my oldest bought them for me. Once it was safe to drive it on snow again, I was too broke to afford gas. Literally, the evening we went to pick up the bike, the car wouldn’t start because there was so low on gas. Once again, oldest son had to come to the rescue and put a jug in so we could start it to finally go get the bike. OK, this paragraph is going to be difficult for me. I had gone nowhere, and seen no one for what seemed months. In actuality, I probably had been out 4 or 5 times since the first of the year, but two were around the funeral of my aunt. I don’t even go out for groceries. I sit alone in front of a computer at work and I sit alone in front of a computer at home. It costs money to leave the house, therefore I don’t. When I found out I wasn’t going to be able to pick up the bike up, it was like having your parole approved and then suddenly revoked. I wasn’t angry, I was major depressed. A friend I’ve never met noticed that. And stepped in to pay the balance of my bill. They don’t know, nor can I convey here, the difference that made. I suppose it’s like the governor stepping in for a pardon while you’re heading back to death row after the parole was denied. I found it strange that it wasn’t happiness that was the emotion of the day but humbleness. Who am I for someone to do this for me? Can’t say thank you enough. You know who you are. Took it easy on the way home as the bars are very different from what I’m used to. I was surprised by how quickly the riding skills came back. “Like riding a bike.” Haha. 🙂 But it didn’t take long to realize that the bars needed to be moved forward. No biggie. Made it home through the potholes, sand, flood zones, and traffic with no problems. 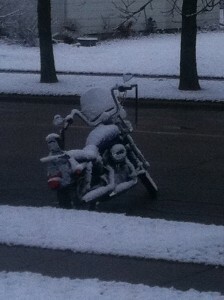 Parked the bike though and wanted to set the clock. There’s a button on the back of the speedometer that lets you do that. Push, push, push. This feels different. Looking closer, the rubber cover over the button was missing. And looking at the speedo, it looked, I dunno, “different.” But the big *gulp* came when clicking to the odometer and it showed 4,000-some miles. Read this blog. It had over 9,000 when I brought it in. I dunno if they messed with it or put the wrong speedo on, but this HAS to be resolved. And the low fuel light is still on. Again, it just pains me to say this, but I don’t think a single interaction with my friend’s shop went smoothly. The bill was as expected, finally. But I could find fault with nearly every thing else. I am so disappointed. I really wanted it to work out. But I have to admit that I can’t imagine myself going back. I don’t know if it’s because I’m still a noob, if it’s because I’m too Minnesota nice, or if that’s just the way it is. I’d usually put an odometer reading here, but at the current moment: ??? UPDATE: It was too cold to stop by the shop on the way home today, but I did call. As I suspected, they also thought they had put the wrong speedometer on my bike. Apparently there was another one just like it that was taken out when a custom one was installed and they got them mixed up. Easily corrected, but still. I’ll get it taken care of as soon as it’s warmed up a bit. 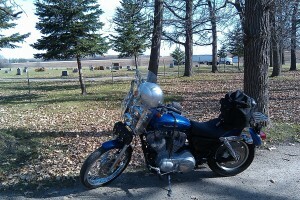 In 2009, I put the Harley in storage in late October after a couple of cold, wet weeks. Of course, then November was absolutely beautiful and I regretted putting it away so soon. So I swore I wasn’t going to park it until the end of November this year. 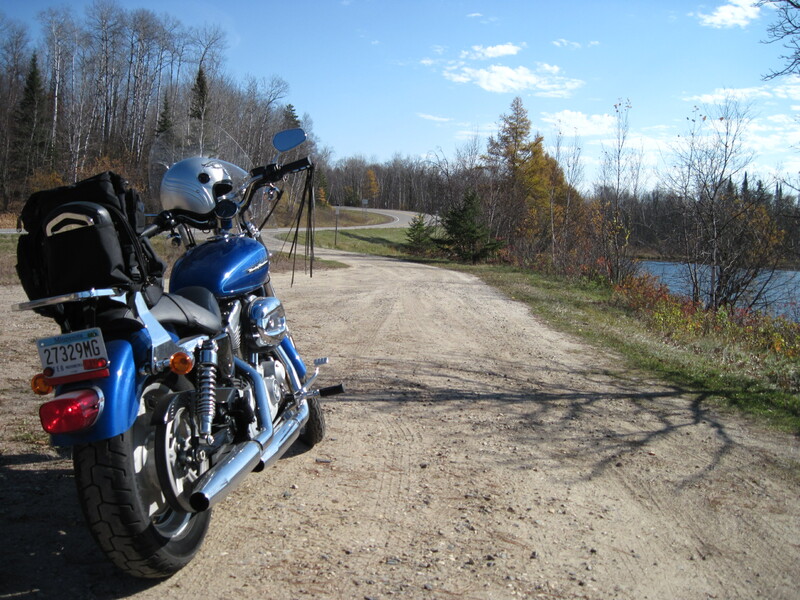 Well, it was a beautiful fall, but by mid-November it was obvious that it wasn’t really the cold that was interfering with riding, but the short days. I rode as much as I could, even if it was only around town. But by Veterans Day (November 11), I decided that was it. Even if it got absolutely summer-like out, I wasn’t going to be able to take advantage of it anyway. So over the winter I’ve had the 10,000-mile service done even though it hasn’t quite gotten there. 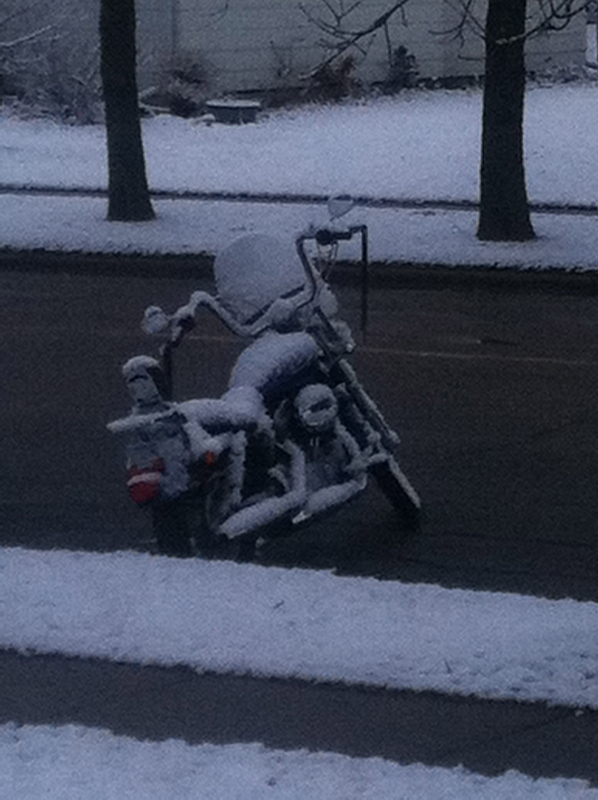 Seems silly to wait until Spring, take it for two rides and then bring it back in for service. 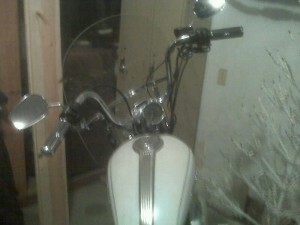 The other thing I desperately want done is to swap out the handlebars. My arms frequently go numb when I’m out for a ride. Worst situation was when I was coming back into town once. Dropped my left hand for a wave and couldn’t get it back up to the handlebars. And of course right about then I’m coming up on a pickup which is slowing down for an intersection. Really needed to get my hand on the clutch. Desperately. Somehow made my dead arm obey, but it was a really dangerous situation. As of today, I’ve ordered some 12-inch mini-apes and I’m looking forward to seeing how much different they are to ride with. 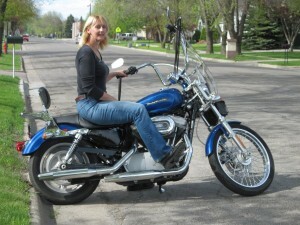 A small part of me is worried the bike will be harder to handle, but I do know that the stock buckhorns needed to go. In one month will be the local bike show. 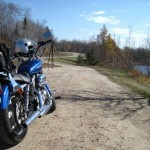 Last year it marked the beginning of the riding season. I hope the same is true this year, but we still have a few feet of snow on the ground and a major flood ahead of us. Time will tell when I will begin riding again. But at least this year I don’t have to wait to have it hauled in from out of town. The first nice day, I can just head over and set it free. 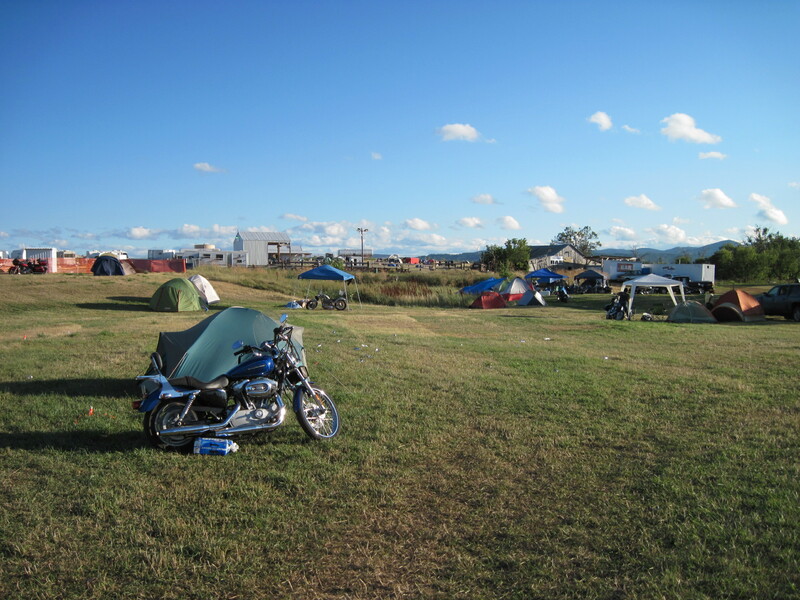 I came home from Sturgis to a job interview, and soon thereafter a job offer. 😀 So the next few weeks were filled with wrapping up projects at my other two jobs and then a week of vacation. I started the new job on October 4 and was happily riding the Harley back and forth to work. The weekend after I started the new job was forecasted to be pretty unbelievable. Highs in the 80s in October just don’t happen around here. As I was financially still between-jobs, I didn’t have more than gas money. But there was NO WAY I was going to let a day like that get by. Especially since it came on a weekend! Didn’t really have a preference for a destination, so I threw it out to my Twitter network. Which direction should I head? North, south, east, or west? Turns out east won. Which might have been good. It’s not a direction I’ve gone a lot on the motorcycle. While the day was going to have summertime temps, it was October and the days were already getting shorter. That meant I could only go so far if I wanted to get back sometime around sundown. 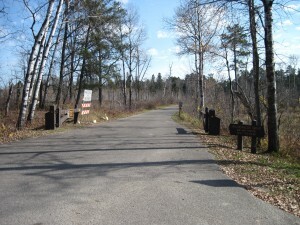 Well, about 100 miles east of here is a state park where the Mississippi River starts. Hadn’t been there all summer, so that settled it. And once again my Twitter friends gave me some good advice. Got a tip about a road that I didn’t even know existed that looked to be a fun one. So up early on a Saturday morning, I packed up and headed out. Given that I didn’t have lunch money, I threw the T-Bag on and put an MRE left over from the last flood in it. 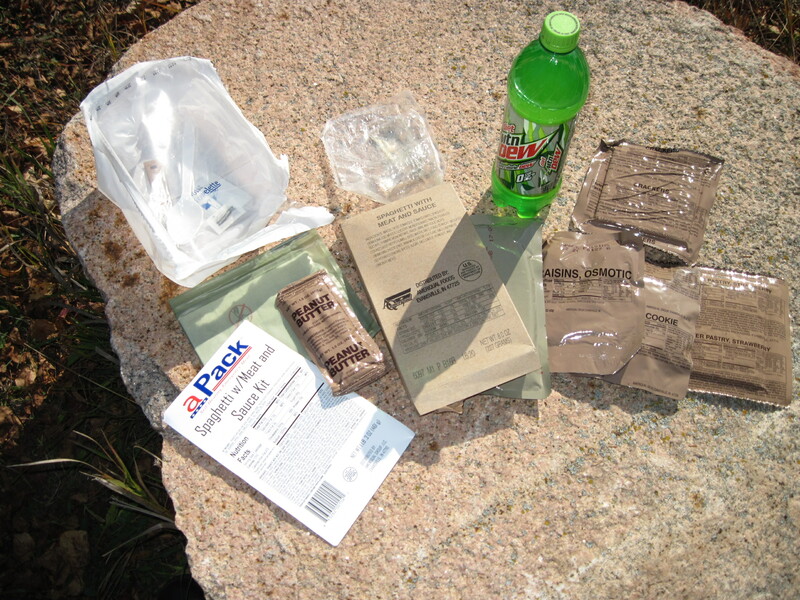 (MRE=Meals Ready to Eat, aka K-rations.) Figured the T-Bag would be useful for stashing jackets as the day got warmer anyway. Headed east out of town on a road that is just one notch under an Interstate. Bit cold, but the sun was getting higher and it wouldn’t take long to warm up. Only stayed on that road 30 miles or so before turning off to a 2-lane, the natural habitat of 2-wheelers. Even that close to home I was already on some roads I’d never been on before. The motorcycle has been good for that. Stopped at a rest area near a little town just to stretch my legs a bit. And since the outhouse was open, take care of that too. Nice little spot along a river and next to a graveyard. Being late fall, most of the trees didn’t have leaves. I’ll bet the place is really nice in the summer, or even earlier in the fall with colored leaves. A few more miles heading north and then the turn to the east on the road that had been recommended. Not a lot of traffic out that way, even with the beautiful day. But as I went further east the road started changing from a straight farm road to a curvy, hilly road through the trees. And I started seeing a few other motorcycles out there too. The more I rode on that road, the more it started feeling like Sturgis and a ride through the Black Hills. Curvy, hilly road surrounded by other bikers on a stunning day. Damn it doesn’t get any better than this!!! Started getting hungry and I had no idea how far I had to go before turning into the park. Finally I spotted a little turnoff by a lake with enough advance notice so I could actually stop. (I had passed a few others that I noticed too late to make work.) Even had a flat rock so I could cook the MRE in comfort. While I was there a couple also stopped. They rode their BMW down from Grand Forks for the same reason I rode up from Fargo. Funny that we met in the middle. Theirs was just a quick stop and I ate my MRE after they’d gone. 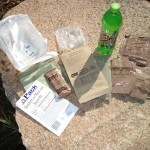 MREs are designed for folks in high-activity situations. Must be at least 3,000 calories in them. I only ate 2 of the 6 items included. That was enough! It really was a pretty spot, but the day was already slipping away from me if I wanted to be home by sundown. So I packed up and headed out only to find I was about 10 miles away from the park. If I had known that, I probably would have held off and had lunch in the park. But I wouldn’t have found the lovely spot then. That’s just one more example of how a motorcycle expands your horizons. Got to the park and the entrance shacks were closed and you were supposed to go to the visitors center to get your permit. OK. So I headed up there and wandered around and really couldn’t figure out where to get the permit. Oh well, I tried. The main road through the park was closed for construction, so I had to jump out and go around to the north entrance. Parked by the other visitor center and then headed out to the headwaters. Any trip to Itasca State Park MUST included a stop at the headwaters. 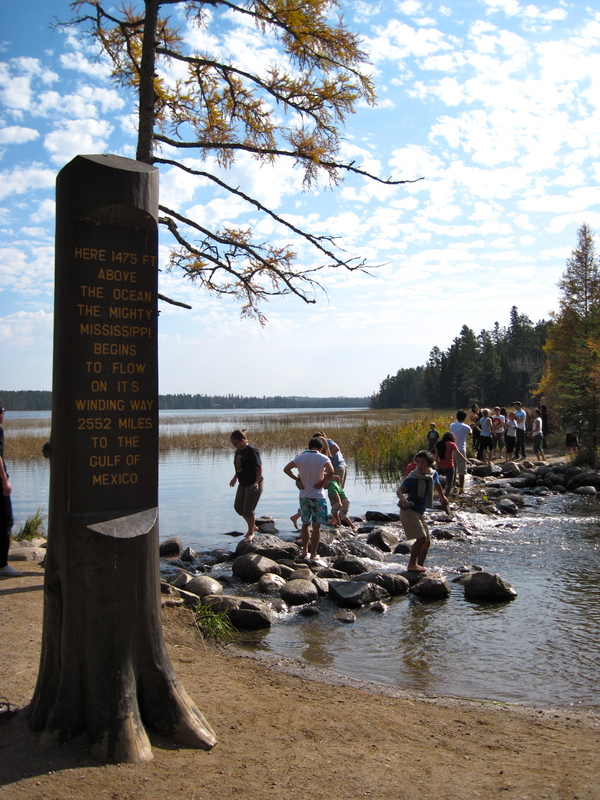 It’s the exact spot where the Mississippi River starts and it’s pretty amazing when you stop to think about it. There were a few people there, like me, taking advantage of the beautiful day. But I didn’t stay too long, and I didn’t attempt the stepping stone crossing. Wet leathers are no fun! Finished up at the park and since it was getting late in the day, I decided to take a different route home. 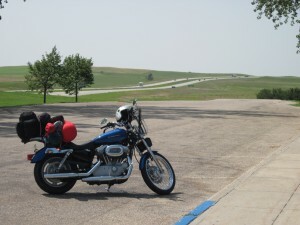 It’s got it’s own hills and curves, but doesn’t have the Black Hills feel of the one I rode in on. But I could make better time. Other than a stop for gas in Mahnomen, there was nothing notable about the ride home. I didn’t quite make it by sundown, but close enough for comfort. Days like this one you know are gifts. I can’t think of any better way I could have spent it. I knew it was the last hurrah for the season. Everything I did that day had a special feel. A new job, a beautiful day. It was good to be alive.